The sprint, yet another scrum event where you can find plenty of sprint anti-patterns to make your life as a scrum team harder than necessary. Learn how to identify and overcome them. 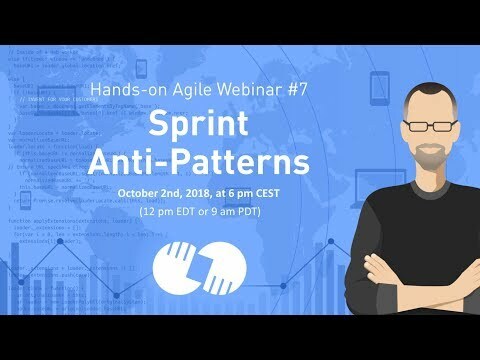 Note: If the browser will not start the video automatically, click here to watch the replay of the webinar Scrum sprint anti-patterns directly on Youtube. This list of notorious sprint anti-patterns applies to all scrum roles and beyond: the product owner, the development team, the scrum master, the scrum team, as well as stakeholders and the IT management. The scrum master has a laissez-faire policy as far as access to the development team is concerned. The scrum master does not object that the management invites engineers to random meetings as subject matter experts. The product owner presented a too granular user story, and no one from the development team cared enough to have a thorough look. The user story seemed ready. Although the sprint itself is just a time-box there are plenty of sprint anti-patterns to observe. A lot of them are easy to fix by the scrum team. Other sprint anti-patterns, however, point at organizational issues that probably will require more than a retrospective to change. What sprint anti-patterns are missing? Please share with us in the comments. Hi, Hannah, I will aggregate the anti-patterns by role across all posts once the remaining two will be available. The next one will deal with sprint review antipatterns. Identify which one your team/organisation is guilty off, see in which bucket they fall and address the underlying problem. Awesome stuff! it is great to see it organised by roles, as a Product Owner sometimes I think I am going insane when I see some of this stuff, or fail to see how what I do affects the team. The Anti-pattern papers bring us excelent remarks. Sometimes it´s more productive to learn from mistakes and bad habits, than from the “what-to-do”.